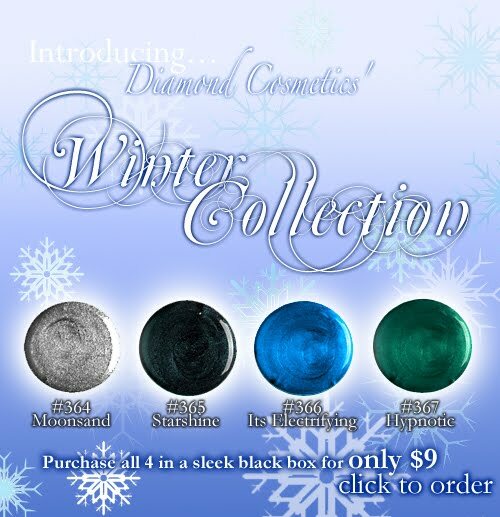 The Winter Collection is now available for purchase at diamondcosmetics.com. The colors look gorgeous! Traditionally, the Winter Collection is my favorite offering from Diamond Cosmetics. I love the exploration of color and unique finishes. The color dots look promising. I will venture that Moonsand is a foil polish. I'm hoping that It's Electrifying and Hypnotic share the same beautiful pearl finish as their well loved Monarch Masquerade. Starshine looks like a blackened teal shimmer. I haven't seen these in person yet, but I hope I have the opportunity to review them soon. If you are planning on placing an order, keep in mind that their offices are closed from December 24th through January 3rd. 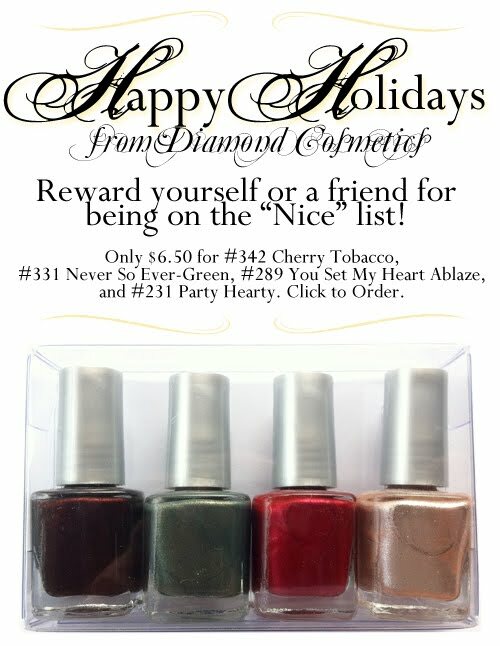 I'm looking forward to Starshine...maybe it will be similar to Deborah Lippmann's Don't Tell Mama? Hypnotic looks great. I also like that four piece set. These look great! I need to make another DC order, its been ages! Chaos Butterfly: I should be receiving these next week. I will venture that Starshine might be even better. Think of Cherry Tobacco and it's glowing shimmer in the dark base. I would love it to have the same quality with a different palette.